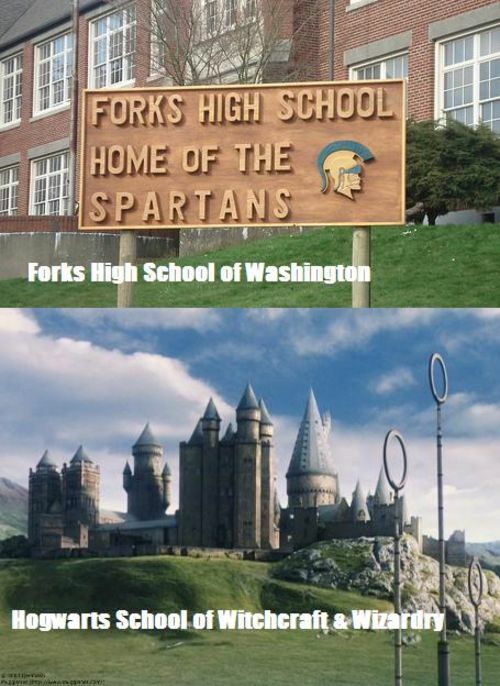 Hogwarts vs. Forks High. . Wallpaper and background images in the Harry Potter vs Twilight club tagged: twilight edward cullen bella swan harry potter twilight series funny. This Harry Potter vs Twilight fan art might contain quartier des affaires, le centre-ville, centre d'affaires, au centre-ville, rue, scène de ville, milieu urbain, ville, scène, urbain, cadre, mise en scène de rue, and école. have you noticed you HP lovers slander us and be mean with images while we T fans just defend ourselves? ^Have you noticed it's mostly HP fans on this spot and your comments are useless? Anyways, even Harry Potter schools are better!! Have you noticed all the Harry Potter pictures like this and all the fans taking a joke and lolling at it? All you do is defend? Oh please, you've been posting about how we're all evil witchcraft lovers and what not.